With the promise of some very rare sun ( it has snowed every day for weeks), I went out to experiment with my Nikon 85mm tilt/shift lens. I read in Outdoor Photographer how Jack Dykinga used his tilt/shift lens to do panoramas. He just uses the shift feature, so I wanted to try it. This shot is far from perfect, but in many ways it was easier than moving the camera. Once you level the camera it will be level for each shift. The hard part was to find out the exposure as you shifted left and then right. It changes from your base exposure as you shift, I quickly learned. I found that as I shifted left I had to open up almost a stop. When I shifted right, I had to do the opposite, stop down about a stop. By watching my histogram this was fairly easy to work out. This shot put together 4 images. I need one a bit farther to the left,, but the left shift was as far as it could go. I'm finding that 85mm is a bit long for scenics where I live. I needed the 24mm which I would have bought had they made them 10 years ago rather than the 85mm. It's easier to learn how to use it with digital than with film since you have instant results. I also used the tilt feature which I'll show in some other images. I've read that you can't use the tilt and shift at the same time with the Nikons lens, but you can with the Canon's. I'll have to give that a go some time and see if that is the case. Anybody got any tips on using tilt/shift lenses? 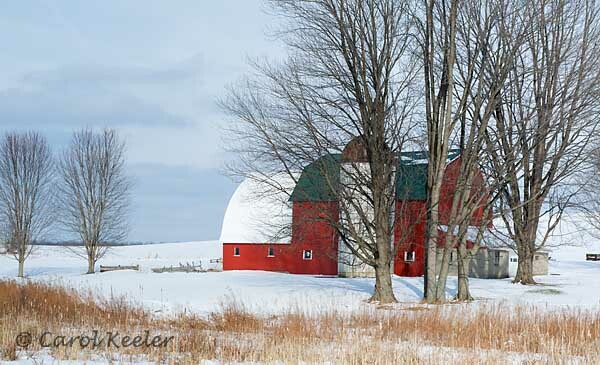 Very nicely composed with the barn behind the trees. The colours stand out against the dull sky and snow. Beautiful work, Carol.BV!